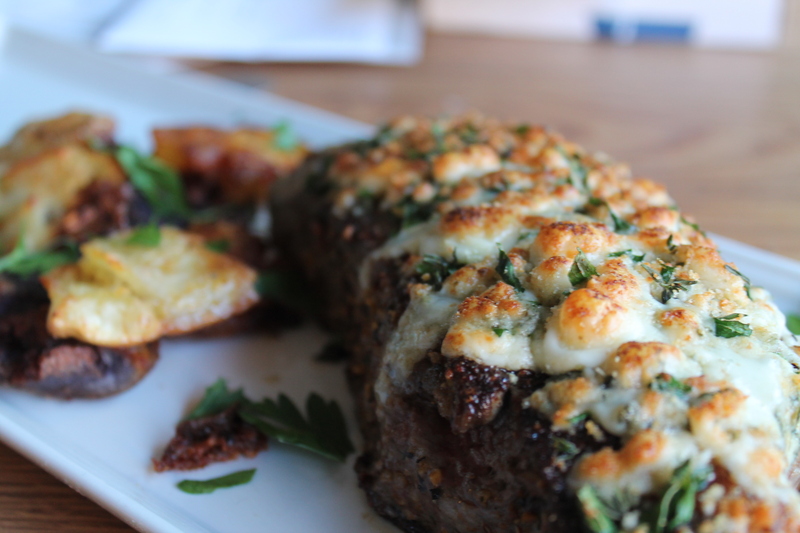 It’s rare that I crave meat, but lately, a really good steak with blue cheese has been on my mind — creeping into my thoughts, ruining my productivity. I can only take so much tofu before I need something with built-in flavor. And the notion that you need to go out to devour a decadent piece of beef is absurd. You can make it in your kitchen in about half an hour. Promise. Vegans and vegetarians, don’t look away just yet! There’s a side-dish recipe buried in this post just for you! Happy cooking, friends. 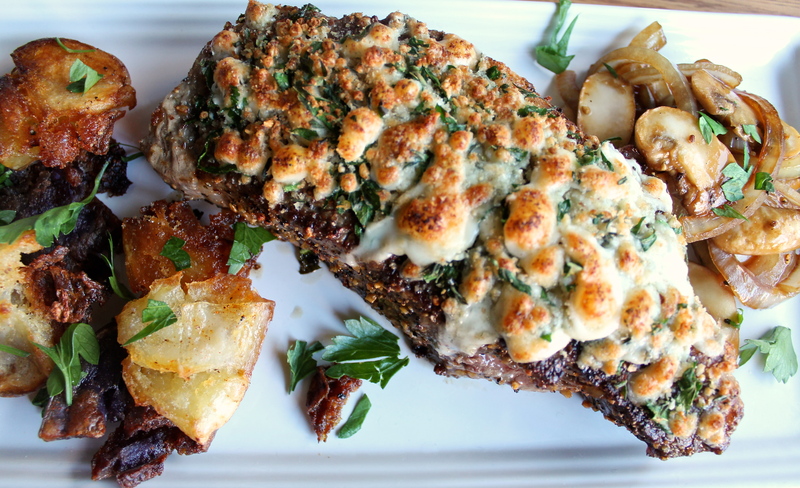 Liven up your weekend with this dish. Indulge. Eat and be merry. 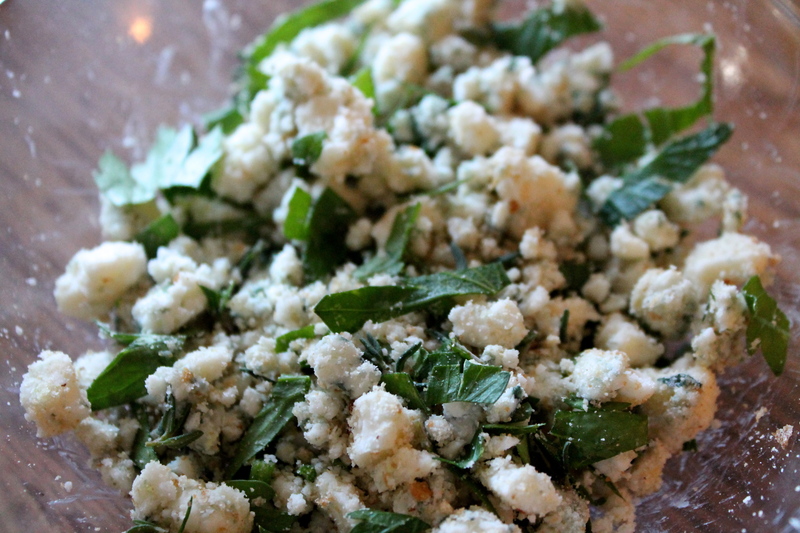 In a small bowl, mix together the blue cheese, bread crumbs, parsley and thyme. Set aside for later. In a cast-iron skillet, melt the butter over medium heat for about 3-4 minutes, or until pan is hot. Meanwhile, season the steak (and make sure the chill is off the meat. Take it out of the fridge 20 minutes or so before you want to cook it). Once the pan is hot (sprinkle some water on it if you’re not sure. The water should sizzle), add the steak and cook on one side for two minutes, or until nicely browned. 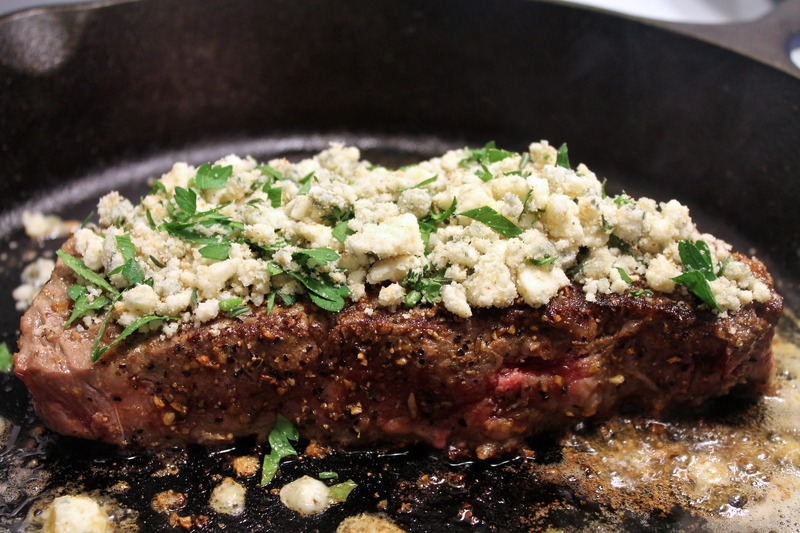 Flip the steak and add the blue cheese crumble mixture on top, slightly pressing down. 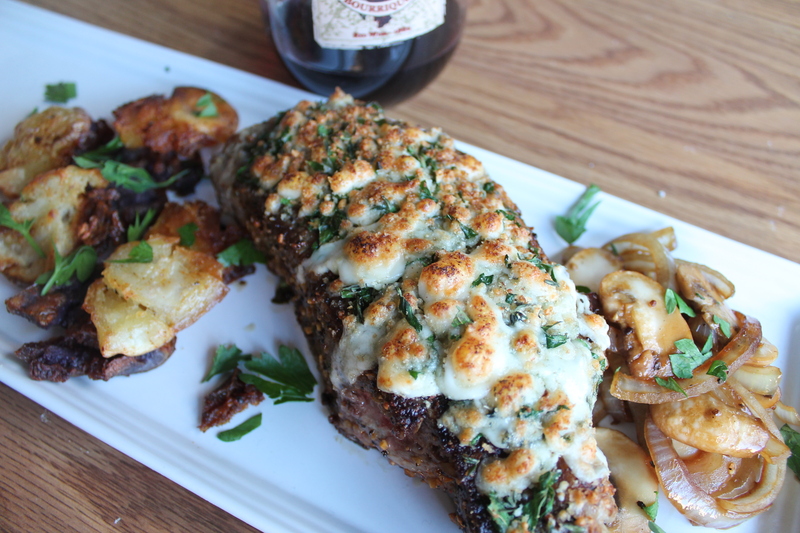 Transfer the skillet to the broiler, allowing the cheese on top to get brown and bubbly. This will help finish the steak to a nice medium doneness. It should take about 5 minutes under the broiler. Let it rest before digging in. It’s hard, I know, but it’s also worth it. 12-15 red, yellow or purple potatoes (about 1-inch in length). Fingerlings work well. Put the potatoes in a large saucepan (preferable in one layer) and cover with at least one inch of water. Add 2 teaspoons salt to the water and bring to a boil over high heat. Once boiling, reduce to a simmer and cook the taters until they are tender, about 30 minutes. Test for doneness with a sharp knife or skewer. They should be cooked through, but not overdone. While potatoes are cooking, set up a double layer of clean dishtowels on the countertop. As the potatoes finish, remove them individually from the water and let them drain for a minute on the dishtowels. Fold another dishtowel into quarters and, using it as a cover, gently press down on one potato with the palm of your hand to flatten it to a thickness of about 1/2 an inch. Repeat with all the potatoes. Don’t worry if some break apart a bit; you can still use them. Cover a large, rimmed baking sheet with foil and line with a sheet of parchment paper. 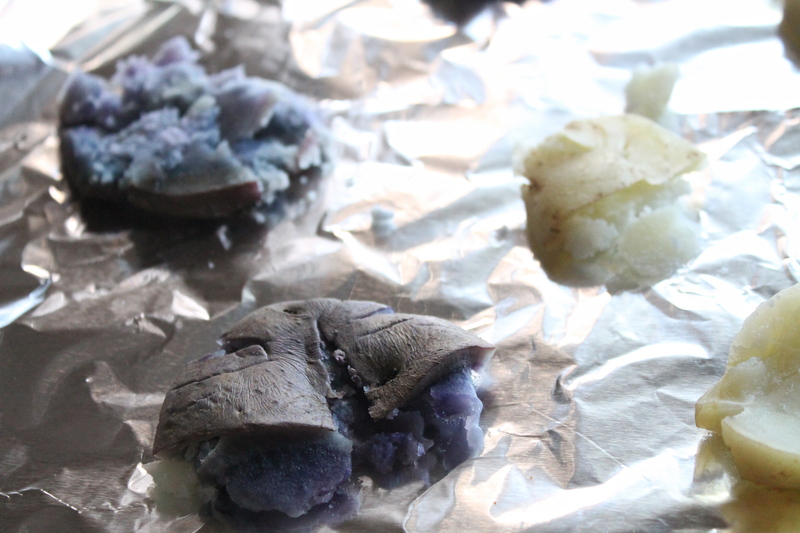 Transfer the flattened potatoes carefully to the baking sheet and let them cool completely at room temperature. 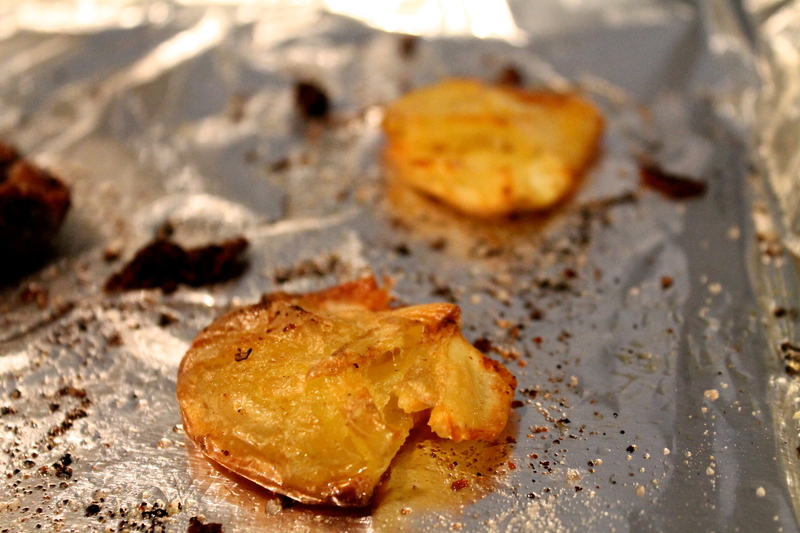 Sprinkle the potatoes with 3/4 teaspoon salt and drizzle the olive oil over all of them. Lift the potatoes gently to make sure some of the oil goes underneath them and that they are well-coated on both sides. 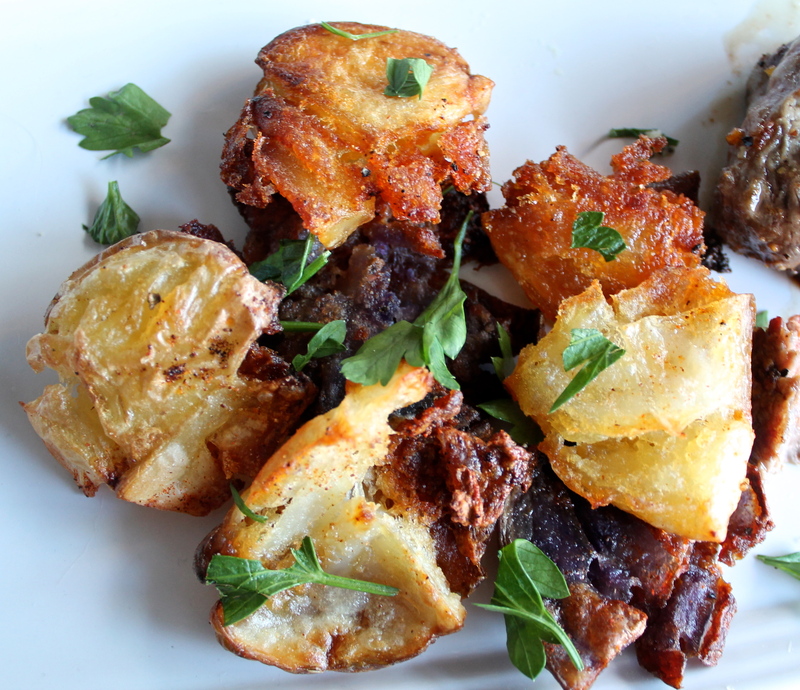 Roast potatoes until crispy and deep brown around the edges, about 30 minutes. Sprinkle with freshly-chopped parsley. 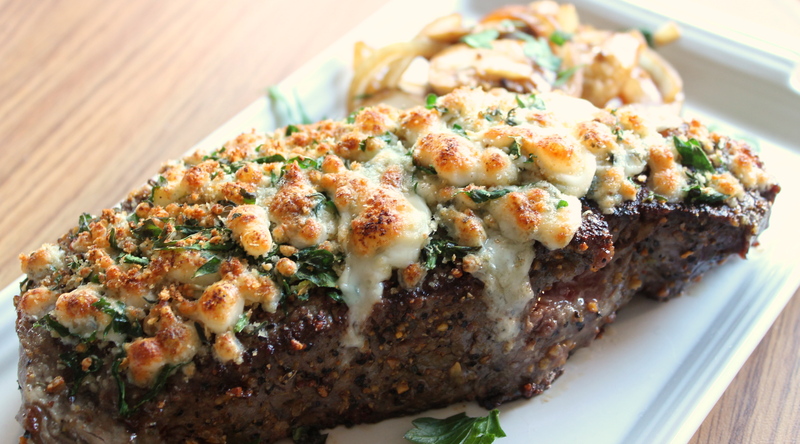 Serve hot and alongside your steak. The potatoes look like a fun side. Those onions look like a great accompaniment as well — I’m crossing my fingers that you’ll have another post soon with tips. When I try onions as a side at home I’m always disappointed — They seem to turn out crunchy and undercooked or melted down to nothing like brown oniony jam. Yours look far superior.